Jeanette Williams was 47 years old and confined to a wheelchair for 22 years. She took pain medication and had also become addicted to crack cocaine. She was an acquaintance of Bruce and Michelle Gillmore, and had lived with the Gillmores at various times. Mr. Gillmore took out a $25,000 life insurance policy on Jeanette and designated himself as the beneficiary. The Gilmores recruited Richard Williams (no relation) to kill Jeanette for $12,000. On March 24, 1997, Williams, Jeanette and the Gillmores drove to the Third Ward in Houston, apparently to buy cocaine for Jeanette and Michelle Gillmore. While Bruce Gillmore stayed in the car, Williams and Michelle Gillmore pushed Jeanette in her wheelchair toward the corner to supposedly purchase the drugs. Williams then grabbed Jeanette's forehead from behind and, using a nine-inch steak knife, slit Jeanette's throat. Once Jeanette fell from her wheelchair, Williams repeatedly stabbed her in the chest. During the investigation, the Gilmores implicated Williams, who confessed to the murder on videotape. Williams had been convicted in 1987 of burglary, arson and aggravated sexual assault, and was discharged one month before the murder. The Gilmores each received Life Sentences. Two chili cheese dogs, two cheeseburgers, two orders of onion rings with French dressing, turkey salad with French fries, chocolate cake, apple pie, butter pecan ice cream, egg rolls, one peach, three Dr. Peppers, jalapeno peppers, ketchup, and mayonnaise. "The statement I would like to make is to all my loved ones - and to the Abrahams and Williams families. We came a long way through the tragedy - from hate to love and I would like to apologize for the pain I have caused all my families on both sides. I am looking at you Mr. Frank: I am sorry brother for what happened to your sister and I hope that you would forgive me one day. Ask God to forgive me and ask God to forgive you and allow me to pass through. My brother Farooq, I love you my brother and send my love to all my family members. And I was not a monster like they said I was. I made a mistake and this mistake cost - but they won't cost no more. I leave you with all my love and blessings. may Allah bless each and every one of you." 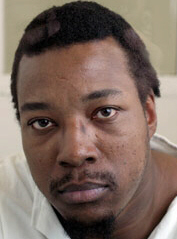 MEDIA ADVISORY - Monday, February 24, 2003 - Richard Head Williams Scheduled to be Executed. Jeanette Williams ("Jeanette") was 47 years old and confined to a wheelchair for 22 years. She took pain medication and had also become addicted to crack cocaine. She was an acquaintance of Bruce and Michelle Gillmore, and had lived with the Gillmores at various times. Mr. Gillmore took out a $25,000 life insurance policy on Jeanette and designated himself as the beneficiary. After being released from a 10 year prison sentence, Richard Head Williams (no relation to the victim) went to live with a friend named Jerrol Blueford. Jeanette and the Gillmores were also friends with Blueford. Several days prior to the murder, Bruce Gillmore approached Blueford about killing Jeanette so that, as beneficiary, he could collect the life insurance proceeds. Blueford refused the offer, but he introduced Mr. Gillmore to Williams. Bruce Gillmore promised to pay Williams $12,000 if he murdered Jeanette. Williams agreed to the bargain. On March 24, 1997, Williams, Jeanette and the Gillmores drove to the Third Ward in Houston, apparently to buy cocaine for Jeanette and Michelle Gillmore. While Bruce Gillmore stayed in the car, Williams and Michelle Gillmore pushed Jeanette in her wheelchair toward the corner to supposedly purchase the drugs. Williams then grabbed Jeanette's forehead from behind and, using a nine-inch steak knife, slit Jeanette's throat. Once Jeanette fell from her wheelchair, Williams repeatedly stabbed her in the chest. Bruce and Michelle Gillmore drove away and left Williams at the crime scene. They drove to Blueford's house and told him that Williams was crazy, and that Williams had murdered Jeanette. The Gillmores gave Blueford $400 to give to Williams as payment for the murder. They also instructed him not to tell Williams where they were going. When Williams returned to Blueford's house, his hand was wrapped in a blood-soaked towel. Williams asked Blueford if the Gillmores had left anything for him. Blueford gave Williams the $400. Williams became noticeably upset over the amount of money, and told Blueford that he would find and murder the Gillmores because they owed him more. The officers who responded to the crime scene initially believed Jeanette was killed in a hit and run accident. She was lying in the street in a pool of blood with her wheelchair approximately three feet away. When the body was turned over, however, the officers discovered the gaping wound to the neck and numerous stab wounds to the chest. According to the medical examiner, the wound to the victim's throat severed her jugular vein and windpipe. It was determined that the victim suffocated and bled to death. The investigation of the murder provided several telephone numbers, which led to the Gillmores, who in turn implicated Williams. Williams confessed to the murder on videotape. Williams was indicted in the 174th District Court of Harris County, Texas, for the capital offense of murdering Jeanette Williams on March 27, 1997 for remuneration or the promise of remuneration. Williams pleaded not guilty and was tried before a jury. The jury found Williams guilty of capital murder on Oct. 28, 1997, and, on Nov. 21, 1997, following a separate punishment hearing, the court assessed Williams' punishment at death by lethal injection. Williams' conviction and sentence were automatically appealed to the Texas Court of Criminal Appeals, which affirmed in an unpublished opinion on May 12, 1999. Williams did not seek certiorari review in the United States Supreme Court. On Jan. 25, 1999, Williams filed an application for writ of habeas corpus in state court. After the state habeas court entered detailed findings of fact and conclusions of law recommending that habeas relief be denied, the Court of Criminal Appeals denied the application in an unpublished order on Feb. 9, 2000. After obtaining appointment of counsel, Williams filed a petition for writ of habeas corpus on Aug. 4, 2000, in the United States District Court for the Southern District of Texas, Houston Division. The district court denied habeas relief on Sept. 27, 2001. Thereafter, on July 25, 2002, the United States Court of Appeals for the Fifth Circuit denied Williams a certificate of appealability in an unpublished opinion. Williams then filed a petition for writ of certiorari in the United States Supreme Court. The Court denied certiorari on Dec. 2, 2002. On Feb. 11, 2003, Williams filed a subsequent application for state habeas relief in the 174th District Court of Harris County. His application is still pending. During punishment, the evidence indicated that Williams had previously served a 10-year sentence in the Texas Department of Corrections for burglary of a building, burglary of a railroad car, arson, and aggravated sexual assault. The State also showed that, while serving his sentence, Williams was subjected to discipline on multiple occasions for assaulting and threatening correctional officers, for spitting in the face of a correctional officer, and for possessing contraband. Richard Williams was convicted of the contract murder of 48-year-old Jeanette Williams, who was in a wheelchair and is no relation. For $400, Richard Williams cut her throat and stabbed her repeatedly with an 8-inch steak knife and left her body in the middle of a southeast Houston street on March 24, 1997. The married couple who arranged the killing, Bruce and Michelle Gilmore, received life sentences. Williams, 33, is seeking to have his execution delayed on the grounds that he may be mentally retarded, a defense made possible last year when the U.S. Supreme Court ruled that executing the mentally retarded is cruel and unusual punishment. A victims advocate called mental retardation the "brass ring" for death row defendants. At least seven Texas death row inmates have had their executions postponed on the grounds that they may be mentally retarded. The latest was Gregory Van Alstyne, who was scheduled to be executed last Tuesday. Several more appeals on the grounds of mental retardation are pending. The Texas Court of Criminal Appeals has not yet ruled on Williams' claim. "I'm trying to get off death row," Williams said. "I've got a life to live." A Harris County jury in 1997 convicted Williams of murdering 44-year-old Jeanette Williams, no relation. Richard Williams turned himself in after his brothers told him police were looking for him. He confessed to the contract killing, then pleaded not guilty at trial. In the confession, Williams said Bruce and Michelle Gilmore offered him $12,000 to kill Jeanette Williams, their friend. They wanted to collect on the $25,000 life insurance policy they had taken out on the woman. The Gilmores are serving life sentences for their role in the crime. A crack addict who had been paralyzed for two decades, Jeanette Williams had lived with the Gilmores on and off for about six years, even moving with them among Houston, Oklahoma and South Carolina. Richard Williams had been out of prison for less than a month when he met the trio. He had served 10 years for a crime spree that included two burglaries, arson and aggravated sexual assault, all committed when he was 17 years old. Williams was staying with his friend Jerrol Blueford when the Gilmores and Jeanette Williams came over for a visit, according to trial testimony. Bruce Gilmore took Richard Williams outside to solicit his help in the murder. Williams confessed to police that he agreed to the crime then. The three co-defendants hashed out the details and price over several subsequent conversations during a couple of drug-filled days, according to the confession and trial testimony. Jeanette Williams often sat in the next room as the other three discussed her murder. Williams said he and the victim even slept in the same bed one night. After his arrest, Williams calmly told police that he talked the Gilmores out of two of their plans for killing Jeanette Williams, including shooting her -- he said the gun would be too loud -- and taking her out of state for the murder. He worried they would be more readily connected with her if they traveled. "I said, `Look, Michelle, let me do my work. Have my money for me and that will be the end of it,' " Williams told police afterward. " `Once I take care of my business, if y'all ain't got my money, then it might be one of y'all being dead, because I don't play about my money.' " He said last week that he was "high and drunk" when he went to the police. Williams opted for killing the victim with a 9-inch steak knife supplied by the Gilmores. The four went on a crack-buying expedition in central Houston on March 24, 1997. Michelle Gilmore wheeled Jeanette Williams down the street in her wheelchair. Richard Williams grabbed the victim's forehead from behind, slit her throat and, after she fell from her wheelchair, stabbed her 13 times. During the killing, the Gilmores drove to Blueford's house. They told him that Williams was crazy, and that Williams had murdered Jeanette. They left $400 and told him not to tell Williams where they had gone. Williams walked back to Blueford's house and learned the Gilmores had cheated him out of most of the payment. "When they come back in Texas, I'm going to bury them," he told police. During his trial, Williams' attorneys raised the issue of his intelligence, calling several witnesses who said he should undergo neurological testing. But when the prosecutor asked Dee Dee Halpin, an educational diagnostician testifying for the defense, if Williams was mentally retarded, she said, "No." She testified that he scored a 93 on an IQ test when was 6. A bill before the Texas Legislature, which is trying to make the state's death penalty law agree with last year's Supreme Court decision, would classify defendants with an IQ of 70 or below as mentally retarded. Williams said last week he believes he is mentally retarded. His attorney, James Keegan, did not return calls seeking comment. Prosecutor Lynn Hardaway, who is handling Williams' appeal, disputed the claim, saying Williams has average to low-average intelligence. Noting the number of condemned men who have claimed mental retardation since the Supreme Court began considering the issue, Dianne Clements, president of the victims advocacy group Justice For All, said it has become a "brass ring" for those on death row. "He and his attorney will grab at whatever straw is available," she said. But Jim Marcus, executive director of Texas Defender Service, said the issue of whether Williams is mentally retarded needs to be examined and that the answer could shift more culpability to his co-defendants. "One of the traits of mentally retarded people is that they're very easily led ... or persuaded by others," Marcus said. "It could be that he's an extremely limited and vulnerable individual." But Williams acts tough, boasting that his gang might kill Blueford for testifying against him. "I am a gang member and a gang leader," he said, adding that he was in the West Side Crips and his street name is Panama. "This dude is in fear (for) his life every day." Later in the interview, Williams said he told the Crips not to kill Blueford so he would not be blamed for Blueford's death. "He might turn up dead in a few years," Williams said, "but I won't have anything to do with it." UPDATE: Richard Head Williams was contrite and took responsibility for his crimes in a final statement seconds before the lethal drugs began flowing into his arms. "I'd like to apologize for all the pain I've caused," he said. Looking at 3 brothers of his victim, "I'm sorry I caused what happened to your sister. I apologize." He expressed love to his family and while acknowledging he made mistakes said, "I was not a monster like they claimed I was. I made a mistake and this mistake cost - but they won't cost no more." However, in an interview earlier this month, Williams said he never saw or knew the victim, Jeanette Williams, 44, and that his criminal past earned him the trip to death row. "The way I look at it, the whole trial was rehearsed," he said then. "They used everything I did in my life against me. It had nothing to do with my case, but that's the way the system is designed, to get railroaded. I'm just a dumb black man with no money, caught in the system." Vanessa Velasquez, the Harris County district attorney who prosecuted Williams asked, "Then why did he give that confession? I had hoped he would reconcile with his own guilt. That's unfortunate. I think he was a cold-blooded killer. He slit a woman's throat who couldn't walk, was a paraplegic, from ear to ear, on a dark street," Velasquez said. "She fell out of the chair but that wasn't enough. He had to continue stabbing her. She was found laying in the road like a wounded dead animal, with her wheelchair thrown to the side." Williams contended, "I ain't did nothing to nobody," insisting he was in Louisiana at the time of the slaying, never received any money for the killing and "didn't know no Gilmores. The whole thing is a setup," he said, also blaming his earlier incarcerations for "being at the wrong place at the wrong time. There were cases I had nothing to do with, but I'm not a snitch," he said. "I wasn't going to rat on anyone." While in prison with a 10-year term for sexual assault, burglary and arson, records showed he had more than 100 disciplinary violations, including assaults and threats on corrections officers. He was discharged Feb. 28, 1997. Jeanette Williams was killed 24 days later. HUNTSVILLE, Texas - A Texas death row inmate was executed Tuesday for stabbing a paralyzed woman to death in a 1997 contract killing in Houston. Richard Williams, 33, was pronounced dead at 6:19 p.m. after receiving a lethal injection for the murder of Jeanette Williams. He was hired by a couple to kill the 44-year-old Williams so they could collect a $25,000 insurance policy. In his final statement, Williams apologized to the victim's family. "We came a long way through the tragedy -- from hate to love and I would like to apologize for the pain I have caused all my families on both sides," he said. Three of the victim's brothers were witnesses. A Houston man sentenced to death for the contract killing of a paraplegic woman in 1997 was executed Tuesday evening at the Huntsville "Walls" Unit. Richard Head Williams, 28, expressed remorse for the murder of Jeannette Williams, no relation, during his final statement. "I would like to apologize for the pain I have caused all my families on both sides," he said. Addressing Frank Abraham, Jeannette Williams' brother, he said, "I am sorry, brother, for what happened to your sister and hope that you would forgive me one day." Williams had given a number of contradictory statements regarding his mental condition and role in the killing in the weeks preceeding his execution, and his contradictions continued right up to his execution. In a written statement, released after the execution, Williams was less than contrite. "I could have been that someone if I (had) been given a chance in life instead of denial or incarceration every time I was arrested for something the community believed I did," he said. "To be here on Texas death row show (sic) all people that we people of American (sic) don't care about helping. This about destroying lives to show they can kill." Jeannette Williams was 44 years old and addicted to crack cocaine when she was murdered on the night of March 24, 1997. Prosecutors say she was killed by Richard Williams as part of an insurance collection scheme masterminded by Bruce and Michelle Gilmore, a Houston couple who allowed the paralyzed woman to stay with them from time to time. Bruce Gilmore, who had taken out a $25,000 life insurance policy on Jeannette Williams and named himself as the sole beneficiary, asked Richard Williams to help kill the woman in exchange for $12,000. Williams attacked the woman during an alleged crack buy on a street corner of Houston's Third Ward. Wielding a nine-inch kitchen knife, Richard Williams slit the woman's throat, severing her jugular vein and windpipe, and stabbed her 13 times. Due to the violence of the attack, Houston police officers originally thought she had been hit by a truck when they found her body near her wheelchair. Richard Williams' execution was the last to be carried out in Texas this month. Michael Dewayne Johnson, who was supposed to be executed tonight for the murder of a 27-year-old man in Lorena in 1995, received a stay Tuesday morning. Richard Head Williams, 43, was executed by lethal injection on 25 February 2003 in Huntsville, Texas for the contract killing of a 44-year-old woman. In March 1997, Bruce and Michelle Gilmore approached a friend, Jerrol Blueford, about killing Jeanette Williams, 44. Williams was an acquaintance of the Gilmores and had lived with them at various times. She was paralyzed and confined to a wheelchair after being shot by her husband 21 years earlier. She was also addicted to crack cocaine. Bruce Gilmore owned a $25,000 life insurance policy on Williams. Blueford declined the Gilmore's request, but he introduced them to Richard Williams, then 27, a friend who had just been released from prison and was living with him. Richard Williams agreed to murder Jeanette Williams (no relation) for $12,000. On 24 March 1997, the Gilmores, Richard, and Jeanette drove to an area near downtown Houston, ostensibly to buy cocaine. While Bruce Gilmore stayed in the car, Michelle and Richard pushed Jeanette in her wheelchair toward the corner of the sidewalk. Richard then grabbed Jeanette's forehead from behind and slit her throat with a nine-inch steak knife. After she fell from her wheelchair, Richard repeatedly stabbed her in the chest. Michelle joined her husband in the car and they drove away, leaving Richard at the crime scene. They drove to Blueford's house and told him that Richard Williams had murdered Jeanette. They gave Blueford $400 to give to Williams and told him not to tell Williams where they were going. When Williams returned to Blueford's house, his hand was wrapped in a blood-soaked towel. He asked Blueford if the Gilmores had left anything for him. When Blueford gave Williams the $400, Williams became upset and said that he was going to find and murder the Gilmores. Williams had prior convictions for burglary, arson, and aggravated sexual assault. He was sentenced to four concurrent 10-year sentences in 1987 at age 17. He never received parole, due to over 100 disciplinary violations. He was discharged in February 1997 after completing his term. A jury convicted Williams in October 1997 of capital murder and sentenced him to death. The Texas Court of Criminal Appeals affirmed the conviction and sentence in May 1999. All of his subsequent appeals in state and federal court were denied. Bruce and Michelle Gilmore were convicted of capital murder and are serving life prison terms. "I ain't did nothing to nobody," Williams said in a death-row interview in the weeks before his execution. Williams said that he was in Louisiana at the time of the murder, he never knew or saw the victim, he didn't receive any money, and he "didn't know no Gilmores." Williams said that he was convicted solely on the basis of his criminal record. "The way I look at it, the whole trial was rehearsed," he said. "They used everything I did in my life against me. ... I'm just a dumb black man with no money, caught in the system." In a message posted on an anti-death-penalty web site, Williams reflected on his lifetime of incarceration in reforms schools and prisons. "Some might say I was bad," he wrote, "but really I was confused on what I really wanted in life, where I wanted to go in this world." The U.S. Supreme Court denied a request for a stay from Williams' lawyer, who claimed that his client was mentally retarded and ineligible for execution according to a recent Supreme Court ruling. The Court denied this request. At his trial, testimony showed that Williams' scored 93 on a childhood IQ test, and a defense expert testified that Williams was not retarded. Prior to his execution, Williams made a written statement complaining of the Texas criminal justice system, which he wrote was "just as crooked as I am said to be." He wrote that he should have "been given a chance in life instead of denial or incarceration every time I was arrested for something the community believed I did." This statement was released after his death. However, in his verbal last statement, Williams took an apologetic tone. "I'd like to apologize for all the pain I've caused," he told his victim's brothers. "I'm sorry I caused what happened to your sister. I apologize." As he continued his last statement, he expressed love to his family. He also said, "I was not a monster like they claimed I was. I made a mistake and this mistake cost -- but they won't cost no more." He gasped and wheezed several times as the lethal injection began taking effect. He was pronounced dead at 6:19 p.m.
"Man Who Cut Throat of Paralyzed Woman Executed in Texas," by Robert Anthony Phillips. HUNTSVILLE, Tex. - A man who cut the throat of a paralyzed woman in a bizarre contract killing arranged by two of her "friends" to collect insurance money was executed by lethal injection Tuesday night. Richard Williams, 33, was pronounced dead at 6:19 p.m., seven minutes after the lethal dose of chemicals began. "I'm sorry, brother, for what happened to your sister and I hope that you would forgive me one day," Williams said before death, speaking to a member of the victim's family who had come to watch him die. Williams requested and ate a final meal consisting of two chiledogs, two cheeseburgers, a turkey salad, french fries and ice cream, Michelle Lyons, a spokeswoman for the Texas Department of Criminal Justice said. Williams had been sentenced to death after confessing to the March 24, 1977 murder of Jeanette Williams in Houston. They were not related. In a videotaped confession, Williams admitted to stabbing Jeanette Williams, a 47-year-old paralyzed crack addict, in the chest and cutting her throat with a steakknife. Jeanette Williams was in a wheelchair when she was slain. She was addicted to crack and thought she was being wheeling to an area where she could buy drugs. Williams said two friends of Jeanette Williams had placed a $25,000 insurance policy on her life. He said he agreed to kill the woman to get about $12,000 of the money. But, he got only $400 and a trip to the Death House. The couple who arranged the killing received life in prison. Williams was released from prison about a month before the murder. He had served 10 years for burglary, arson and aggravated sexual assault. Defense lawyers had attempted to get the courts to block the exeuciton, arguing that Williams was mentally retarded. In an interview with the Houston Chronicle Williams said the videotaped confession he gave police was phony, indicating police had another man pose as him and confess. Williams became the 298th convicted killer put to death in the state since 1982. The state of Texas is scheduled to execute Richard Williams, a black man, Feb. 25 for a 1997 contract killing in Houston’s Third Ward. He allegedly stabbed Jeannette Abraham Williams (no relation) for a $400 payoff from Bruce and Michelle Gilmore. He has a teenage son, Jason, whom he prays for daily, and has loyal pen pals who he corresponds with regularly. All too often, states ignore the obvious trauma executions like this cause children, family members, and friends, and fail to recognize the second set of victims affected by crimes resulting in the death penalty. This problem is especially apparent in Texas, which remains in a league of its own in terms of capital punishment. Unfortunately, despite a decline from 2001 to 2002 in the other 37 states with death penalty statutes, Texas nearly doubled its own total from the previous year, recording 33 executions. Early projections indicate that those numbers will only increase in 2003, and it appears the trend of the Lone Star state accounting for approximately half the nation’s executions will continue. Currently, Texas has 18 pending executions scheduled for early 2003; the rest of the states and the federal government combined have only 9 dates set. Williams’ execution, if carried out, will only continue the dismal legacy of the death penalty in the state of Texas. Furthermore, Williams stood trial in Harris County – the state’s, and nation’s leading county in handing down death sentences. This execution, if carried out, will further destroy another family and continue the cycle of violence in Texas and the United States. Please write Gov. Rick Perry and request clemency for Richard Williams. HUNTSVILLE (AP) - Condemned killer Richard Head Williams acknowledged his crimes and asked for forgiveness before he was put to death for fatally slashing and stabbing a wheelchair-bound woman in Houston less than a month after he got out of prison six years ago. In a written statement released after his death Tuesday night, however, he criticized the Texas criminal justice system for being "just as crooked as I am said to be." "Now I lay here dead," he wrote. "But we have gave all Texans the sign that in some instances and some cases, 'Killing is alright to do as long it's for justice of the American people,'" he printed in capital letters. "So who win? No one do!" He was more reserved in his spoken words from the Texas death chamber gurney, apologizing for the pain he caused his family and saying he was sorry for killing 44-year-old Jeanette Williams. "I hope you would forgive me one day," he said, looking at his victim's three brothers, who watched through a window a few feet away. One of them nodded in agreement. Seven minutes later, the 33-year-old Williams was pronounced dead, making him the ninth Texas inmate executed this year and the third this month. He already had been convicted of burglary, arson and sexual assault and had completed a 10-year prison term when he was sent to death row for killing Jeanette Williams, who was not related to him. In recent interviews, he denied any involvement in the 1997 slaying even though he gave a confession to authorities. Instead, he said his criminal past was used to convince a jury he should be sent to death row. "I'm just a dumb black man with no money, caught in the system," he said. "He essentially lived a life of crime," said Vanessa Velasquez, the Harris County district attorney who prosecuted Williams. "From like age 12, he'd been in trouble all his life." The murder of Jeanette Williams occurred 24 days after Williams finished serving nearly all of his 10-year term. "It almost seemed he wanted to go back," Velasquez said. "He'd become so institutionalized he wanted to go back, and so to slit somebody's throat for $300 or $400 was nothing to him." Williams' attorneys insisted in unsuccessful last-ditch appeals he was mentally retarded and could not be put to death because of a U.S. Supreme Court ruling last year that barred execution of the mentally retarded. At his trial, however, testimony showed his IQ at age 6 was 93, well above the threshold of 70 for mental retardation. "I'm not the brightest person in the world but I'm not the dumbest person in the world," Williams said from death row. Authorities said Williams was given $400 to kill Jeanette Williams by a couple who had been caring for her intermittently and had taken out a $25,000 life insurance policy on her. Jeanette Williams was a crack addict who was paralyzed after she was shot by her husband 21 years earlier. Prosecutors said Richard Williams, who was promised $12,000 for the job, used a 9-inch steak knife supplied by the couple, Bruce and Michelle Gilmore, to kill the woman March 24, 1997, as she wheeled down a Houston street. The Gilmore couple was convicted of capital murder for their part in the scheme. Each is serving life in prison. Hello, I'm Richard. I'm 32 years of age, born on July 19, 1969. I am a black American, light brown complexion, with brown eyes, natural blackish-brownish hair. Stand 6'3'', weight 250 lbs. I'm intelligent, funny, honest, talented and like many friends say - emotionally available. And I'm also very caring to friends. I'm single, have one child, whom I deeply love and pray for daily. His name is Jason, age 15. I enjoy reading all types of books or novels and I also write short stories (mostly exotic fantasy and urban fiction). Before my death sentence I was incarcerated nearly 18 years of my life on and off in different institutions from reform schools to prisons. Some might say I was bad... But really I was confused on what I really wanted in life, where I wanted to go in this world. But I was a true musician, songwriter as will as a singer - rap entertainer. Also I am a cartoonist. I have been on Texas death row awaiting execution for 2 years, 10 months and 4 days [written Aug. 11, 2000]. Spend my time reading, writing, talking to fellow inmates on row. I love sports such as baseball, basketball, football, tennis, hockey ect. I would like to correspond with people of the age 35 to 99, that don't have any problem writing and helping a death row prisoner. I'm praying to hear from somebody out there. Hello ! I'm a Black African American, 29 years of age. Date of birth 07/19/69, 6 ft 3 1/2 inches, 230 lbs, from Houston, Texas. A high school graduate of '85 from Benjamin Franklin High in New York. I'm looking for anyone that's willing to write a prisoner that's interested in a person on death row. My hobbies are: reading, writing, drawing, songwriting... will answer all letters. Excerpt From Concurring Opinion - In my opinion, an applicant must, at a bare minimum, provide evidence of at least one I.Q. test (preferably taken before the age of 18) from which a reasonable trier of fact could conclude that the person is mentally retarded under Atkins. Better yet is evidence of several such I.Q. tests, coupled with supporting school and medical records, and record evidence or affidavits from qualified experts (or laymen with sufficient personal knowledge of specific conduct) that at least raise an issue concerning applicant's lack of adaptive skills and the onset of mental retardation before age 18. When applicant was in the first grade, his Slosson I.Q. tested at 93. In 1981, his verbal I.Q. tested at 65, his performance I.Q. at 85, and his full score I.Q. at 72. In 1982, applicant's I.Q. score (WISC-R) increased to Verbal 68; Performance 96; Full Scale 80. The assessment at that time, when applicant was in the 6th grade, was "intellectual functioning in the low average range. Significant discrepancy in development of his nonverbal intelligence. Characterized as a visual learner. Academic achievement (esp. in reading) below intellectual functioning." When applicant was 14, every teacher noted poor or very poor attendance. One stated that he "has the ability to learn but needs much individualized personal instruction and attention." Another stated that "when in attendance [he] was making a passing grade ... If Richard would stay in attendance he would average a C or B for a nine weeks period." It was also noted that applicant had "poor peer relationships," "defies authority," and "leaves home but never arrives at school." In 1984, when applicant was 15 and charged with burglary of a coin-operated machine, he was given a psychological assessment. The examiner stated: "Richard [applicant] is functioning in the borderline range of intellectual ability as assessed by the Peabody Picture Vocabulary Test on which he obtained an IQ of 72." At that time, applicant was in regular 8th grade classes but was expelled for fighting. The examiner stated that applicant's poor performance in reading and spelling "show a lack of ability to use phonetics, i.e. to sound out words. Consequently he reads entirely by sight and his sight vocabulary is very small." The examiner also stated that "[p]rojective tests and clinical impressions indicate that [applicant] is an immature boy who wants and needs positive relationships with others." Applicant also felt "overcontrolled or caged in by his parents" and "seems to perceive his mother as negatively controlling and withdrawn." In the "Conclusions" section of his report, the examiner does not mention any mental deficiencies, but rather focuses on the fact that applicant's needs were not being met at home and thus outside placement was recommended to provide "support and consistent limits which are enforced in a non-reactive, calm fashion." In 1985, the Texas Youth Commission retested applicant and he again obtained a 72 Peabody "full score I.Q." It was noted that applicant made "minimal effort" during the testing. When applicant attended Crockett State School under the control of the Texas Youth Commission, his school work improved dramatically: he made A's in Math, B's in Survival Skills, English/Language Arts and P.E., and C's in Social Studies and Health. He tested in the 53rd percentile on the TONI test of Non-Verbal Intelligence. In 1985, applicant was placed in Vocational Education for the Handicapped classes at Wheatley High School, where he received mainly A's and B's and his teacher reported applicant had a "generally positive and serious approach to schoolwork" and that "a lot of good things are waiting for [applicant's] positive influence out there." Despite these improvements, applicant dropped out of school three months later. According to a defense psychologist expert who testified at applicant's capital murder trial, applicant suffered from developmental delay, a learning disability (dyslexia) and impaired motor function. By the time of his capital murder trial, he also had some possible brain dysfunction. This evidence certainly supports a conclusion that applicant has dyslexia- a learning disability- which has adversely affected his reading abilities, as well as his ability to score well on the verbal component of an I.Q. test. But dyslexia is not mental retardation. Applicant's factual allegations and writ materials also support a conclusion that applicant is not well-educated, has poor motor skills, some possible brain dysfunction, and has not shown much interest in education during his youth (except for a short period during and after his stay at TYC when he improved dramatically), but none of this constitutes "sufficient specific facts" to support a claim of mental retardation under Atkins.